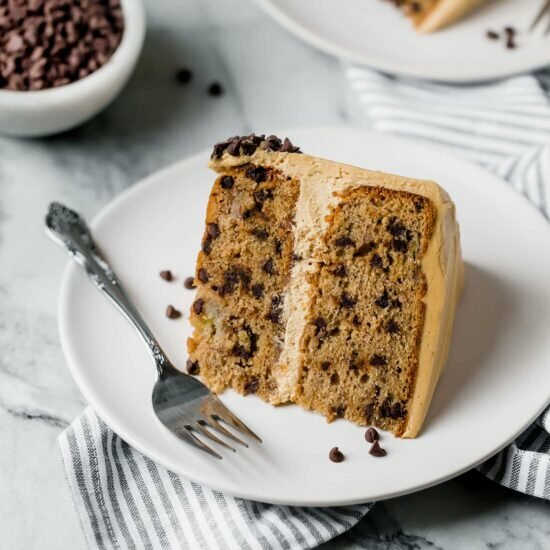 Bursting with sweet flavors, Banana Chocolate Chip Cake with Peanut Butter Frosting is a huge crowd-pleaser and better than any store-bought cake. Love! Download my FREE Buttercream Guide here! Taste: The combination of banana, chocolate, and peanut butter is incredible. I love it SO much. 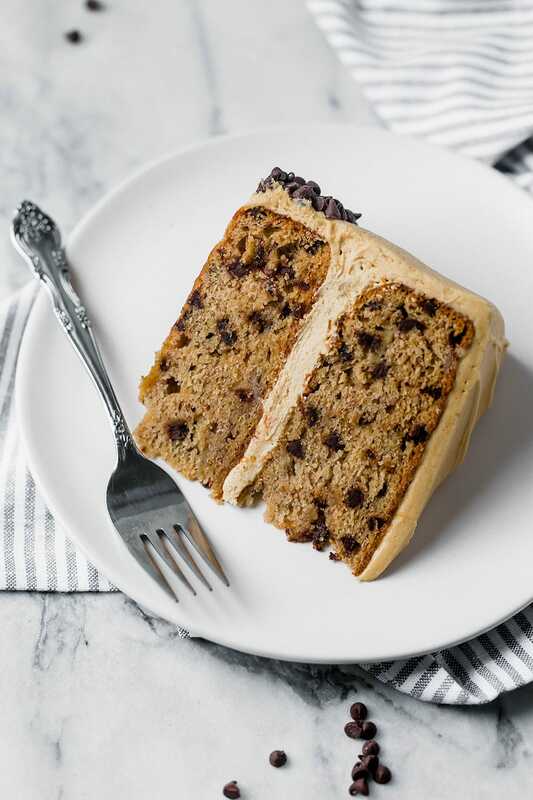 Texture: The cake is ridiculously moist and tender with bites of mini chocolate chips throughout. The frosting is ultra creamy, luscious, and smooth. Every bite makes your mouth happy. Ease: Relatively easy as far as homemade cakes go, just get ready to make a bit of a mess. Pros: Everyone in my family loved this cake! It’s SO much better than any store-bought cake and pretty easy too. Would I make this again? Absolutely. 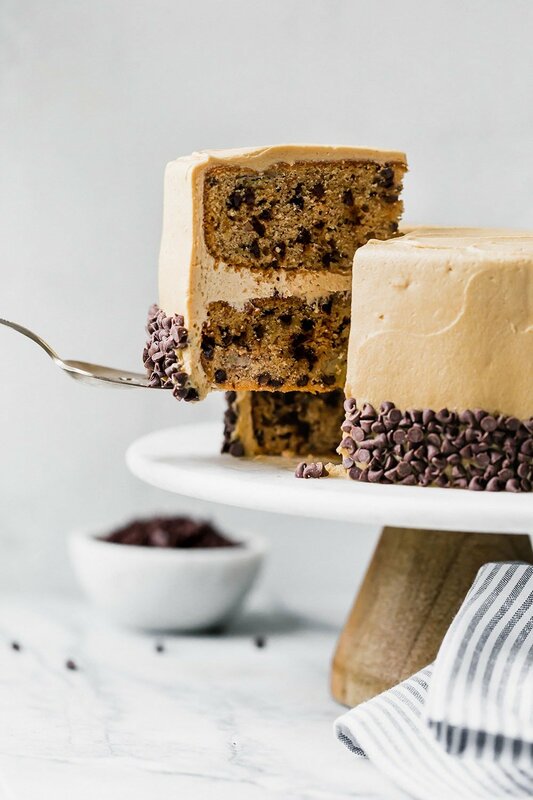 This banana chocolate chip cake with peanut butter frosting is outrageously good. And you know what? I’m not a huge fan of cake in general. This is probably because most cakes are bland, cloying, and lacking in contrasting textures. They sure are pretty and impressive, though. And sometimes a cake is just necessary for something to feel like a real celebration. Even if you’re just celebrating the fact that it’s the weekend! So every once in a while I can find the inspiration to create a new cake recipe. We had some very ripe bananas laying in the fruit basket so I figured a banana cake would be perfect. Because sometimes banana bread just doesn’t hit the spot. What goes best with bananas? Chocolate and peanut butter of course! This cake recipe is pretty simple and straightforward. If you’re someone who LOVES frosting, or if you plan to decorate with this frosting, then I would suggest doubling the buttercream ingredients. Otherwise I think you’ll adore this recipe just like we do!! Preheat the oven to 350°F. Butter and flour two 8-inch round cake pans. In a medium bowl, sift together the flour, cinnamon, baking powder, baking soda, and salt. In the bowl of an electric mixer, beat the butter and sugars on medium-high speed until light and fluffy, about 3 minutes. Add in the vanilla and then the eggs, one at a time. On low speed beat in half the dry ingredients then the sour cream and bananas. Beat in the remaining dry ingredients. Stir in the chocolate chips. Divide the batter among the prepared pans. Bake for 35 to 40 minutes, or until the cakes are golden brown and pull away from the edges. Cool in the pans for 15 minutes before flipping onto cooling racks to cool completely. Refrigerate until ready to frost. The colder the cake, the easier it will be to frost. You can even pop the cake in the freezer for 30 minutes to chill. In the bowl of an electric mixer, beat the butter and peanut butter on medium-high speed until light and fluffy. Add the vanilla, salt, and powdered sugar and continue beating until the frosting is smooth and fluffy. 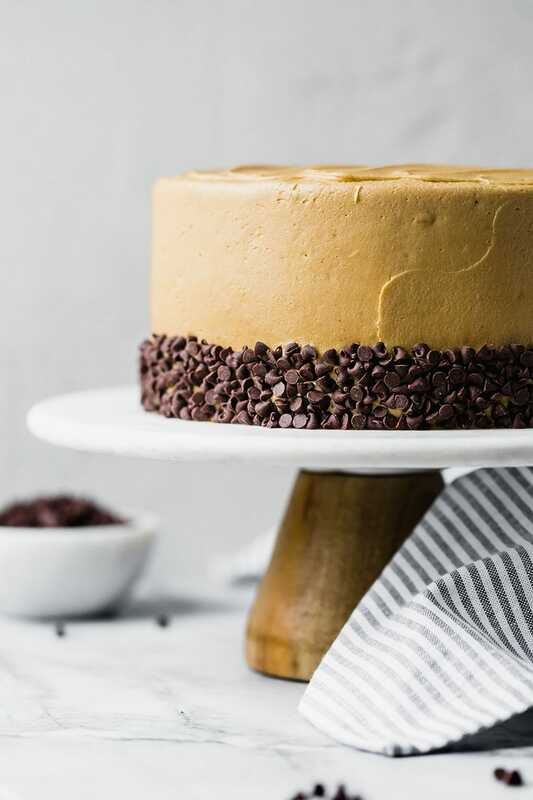 Place one cake layer on a cake turntable or cake stand. For a smooth and even frosting coverage, use a pastry bag and open tip to pipe a generous ring of the frosting around the top edge of the cake layer. Fill up the frosting ring with additional frosting, spreading to create an even layer. Place the other cake layer upside-down on top of the frosting so that the top of the cake is nice and flat. With an offset spatula, spread the remaining frosting evenly all over the cake, smoothing the edges. Place chocolate chips along the bottom of the cake for garnish. Serve or cover and store in the fridge for up to 2 days. Let come to room temperature for an hour before serving. This recipe was originally published in 2014 and recently updated with new photos, weight measurements, and improved directions. Photos by Jess Larson. I haven’t seen that trailer, but it sounds absolutely insane. 1. She is crazy. But it sounds like the trailer establishes that. 2. I’ll GLADLY eat her share! Love the banana, chocolate and peanut butter combo, so irresistible! Can I just bake the cake in one cake pan, then later cut it into half? If that so, do you know how long should I bake? No, the batter needs to be divided in half and cooked in two pans. All the batter in one pan would be way too much and would likely overflow and/or underbake in the center and burn on the outsides. Is there a way to make this a little healthier? Maybe, somewhat, gluten free? This looks delicious!! Can I bake this in a 9 x 13 pan? or cupcake tins? We halved the recipe and it turned out amazing!! Would this work as cupcakes? Sounds delish! Can you make it in a 9 x 13 pan? I tried this as cupcakes and it turned out amazing! Now I’m making it for my nephews birthday. Thanks so much! Hi! Tried the recipe and fell inlove(: I’m now wondering how they do as cupcakes. Same Moist texture? And are cup liners okay, do they stick to them? This sounds great! I’m going to make it for our church dinner/auction tomorrow night. I made this layered for my husbands birthday cake. 40 minutes was a bit too long for the round pans (cake was dense and dried out after cooling) I also had to double the frosting to make enough to frost the whole cake. Very nice recipe! I love chocolate cake with any combination. 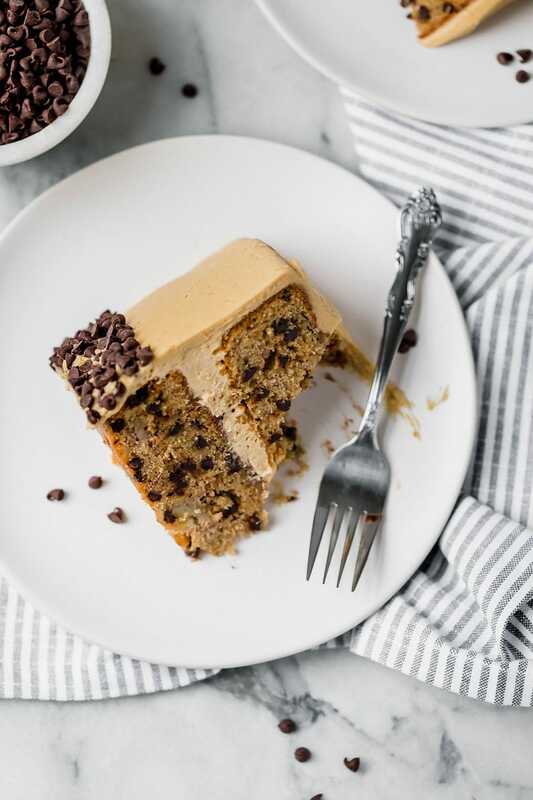 Even i am also not a fan of cake but this banana choco chip cake with peanut butter frosting completely flattered me. I can say this is going to be my mother’s day treat to my mom/. 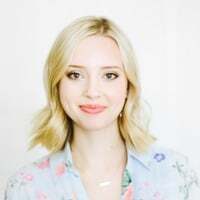 Thanks for inspiring me. gorgeously unique dessert recipe, banana chocolate always works it’s just not as celebrated as peanut chocolate, thank you! Hi. Can’t wait to try this cake, only problem is that we don’t have sour cream available here in Pakistan. Can I substitute sour cream with yogurt instead? Can I make the cake without the frosting (peanut butter) part? Will it still remain soft and moist? This the most delicious cake ever! I decided to do this as a treat to my mom when ahe came back from a trip and i do not regret it one bit! I used full fat natural yogurt and it worked like a charm. Its the most moist cake ive ever baked. There is NO mention of EGGS in the ingredients section at top of recipe, but itvsays to “add eggs one at a time” in the instructions. Halved the cake and frosting recipe and just made one 8 inch round cake. I am not a cake person but loved this! All of my favorite flavors together! I want to make this cake for my husband’s birthday. I want to make it in 2 12 inch pans that are 2 inches deep, because we have having a large crowd for his party. Would I need to make 4 separate batters to get the rise I want for a two tiered cake? I know I need to bake them for about 42-45 minutes, but was unsure how much batter to make. Any help would be appreciated. Hi! This looks so delicious delicious! Did you use semi-seeet or milk chocolate chips? THanks! You can use either! I prefer semisweet. Followed the recipe exactly and it does not work. Even after 45+ minutes in the oven the cake came out raw at the bottom and in the center. Maybe a 9” round cake pan or baking as a sheet cake or cupcakes would work better.